This summer again, our guests can enjoy special TATRY Card discounts! The regional TATRY Card is the key to new experiences and activities that the Region of the High Tatras offers. An ecological water park, mountain resorts with a wide choice of sports activities, culture and history – all this guarantees unforgettable moments on a non-traditional holiday. Have fun with all your family and enjoy boating, adrenaline Zorbing, tubing and climbing in a rope park. Rent a segway or a bike and try more or less difficult cycle routes. Even in bad weather you can visit interesting museums, a new attraction called Tricklandia or try tenis, minigolf, a golf simulator, bowling and other amusing indoor sports. Take a walk in the beautiful nature of the Tatra National Park and then, recharge your batteries in modern wellness centres and taste delicious culinary art in restaurants that serve national and international specialities. 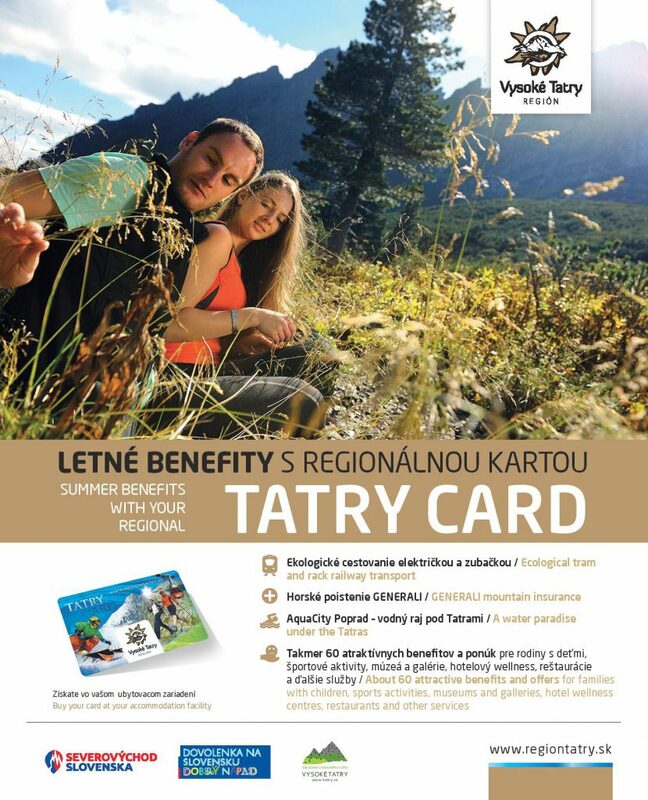 The TATRY Card includes the GENERALI mountain insurance for hiking trips along marked tourist trails again as well as unlimited ecological transport in the High Tatras with trains of the ZSSK company (Slovak Railways) on the routes of the Tatra Electric Railway, Rack Railway and the route Poprad-Tatry – Studený Potok – Tatranská Lomnica, where the TATRY Card can be used as a travel ticket.